It was one of those whirlwind days when something big happened in motocross away from the racetrack. After Chad Reed’s sensational comeback was derailed by a shoulder injury, the former two-time Monster Energy AMA Supercross Champion was forced out into the operating room and out of the rest of the current series. That left his #22 Discount Tire Kawasaki 450 on the bike stand without a rider, and his team on the sidelines. In stepped former 250 Motocross Champion Dean Wilson, making his own comeback of sorts, but also now pretty much out of the 250 West Region SX title chase (which is now on hiatus until April anyway). Calls were made, deals were reached and suddenly Chad Reed’s team had a new rider and a new number: Dean Wilson. Racer X tracked Dean down tonight to find out how it all went down. Racer X: Alright Dean, it’s almost 5 p.m. here in Corona, California. 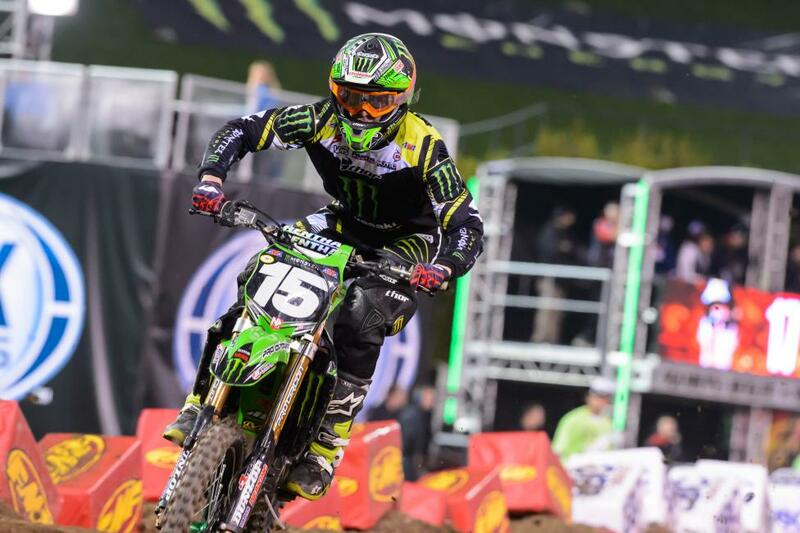 Word is out that you got something cooking with Chad Reed’s team, and everyone wants to know about it. So just what went down this afternoon? Dean Wilson: Well, today was the first day I tested the TwoTwo Motorsports (Discount Tire Racing) 450 machine. It all came about last Saturday in Dallas when Chad couldn’t go with his shoulder injury. He called me and asked me if I wanted to race his bike and I said, “Yeah, for sure!” I mean, it was a great opportunity and I just wanted to keep racing. Obviously things needed to be worked out with sponsors and stuff like that because there were some conflicts. Tuesday night we got the clear to go ahead, so we tested today and it was a good day. I just really want to thank Mitch Payton at Pro Circuit and Reid Nordin at Kawasaki for letting it all happen. I also want to thank my mechanic Oliver Stone for coming out today. He really helped me out a lot. Now I’m really looking forward to getting in some races on this 450 machine. How is the bike? 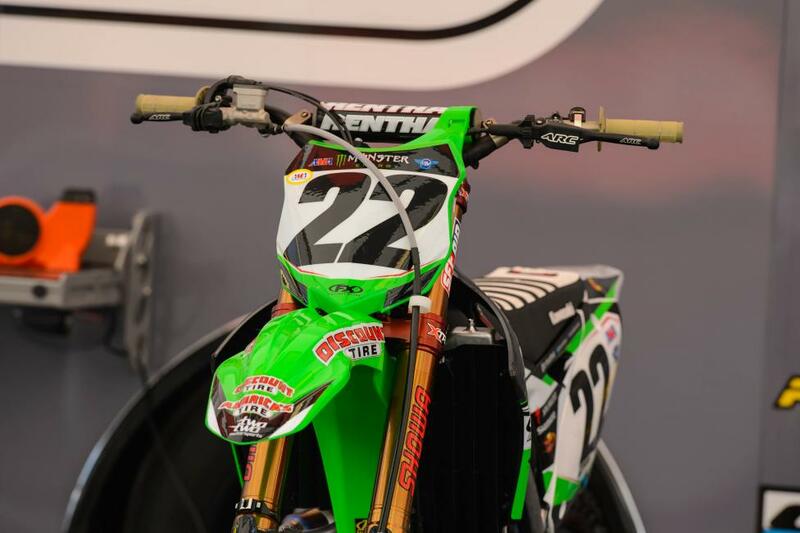 I’m sure fans out there are going to want to know how your Monster Energy/Pro Circuit/Kawasaki KX250F lines up against Chad Reed’s KX450F. I really like Chad’s bike. I think the engine is really good. I felt pretty comfortable on it real fast. Today we just pretty much setting things set-up to where I feel comfortable with my handlebars and clamps and all that sort of stuff. I was really comfortable on it. The engine was really strong and good and the handing was good as well. I definitely think I’m on a solid bike. Are the bikes pretty similar, the 250 and the 450? Or will it take time on a proper supercross track like Atlanta this weekend to get a better feel and understanding? People know that you were faster than the 450 riders in a few of the practice and qualifying sessions out west. Well, I won’t be racing Atlanta. Mitch wants me to have a week under my belt before I race the 450. But between the 450 and the 250, the 450 is obviously a lot heavier. You can’t throw it around like the 250. You’ve got to be smooth and hit your marks, pretty much. I mean it’s a pretty big machine just to toss around. And my Monster Energy/Pro Circuit/Kawasaki 250F is just awesome. Mitch and everybody at Pro Circuit have got me on a really good bike and I’m really happy with the whole team. They’re really awesome and always have my back and if there is ever anything that needs to be done to benefit me, they will bend over backwards for me. That’s what’s so awesome about that team. And Chad’s TwoTwo Motorsports team, so far, has been really awesome and I’m really enjoying it. Well, honestly my plan was to try and win San Diego and then start focusing on my outdoor testing. I felt like I was going in the right direction to win San Diego but then I made a stupid mistake on my part and crashed and then my front brake caliper got landed on and it broke so I got last. That was a pretty big heartbreaker for me because I had good momentum going from Oakland all the way to San Diego and I pretty much thought that I had that race won. Ever since San Diego I’ve been really pissed off and I just want to race. I’ve been pretty upset with myself for making that stupid mistake. Now I just want to try and stay positive and get the 450 races under my belt and gain some experience, as well. You raced the Monster Cup on a 450 didn’t you? Yeah, Monster Cup was just kind of shaking the cobwebs out because that was really my first time back since my shoulder operation. I would have been in the top five in points at the end of the day if I wouldn’t of messed up and made a mistake in the first race and finished 20th. But, yeah, I felt on the pace on the 450. I think I’ll be fine. You told me back in December that you were taking a step back and riding the 250 this season so you could regroup and get it all back together for a run on the 450 in 2015. Maybe this shot on Chad’s #22 bike might really work out in a number of ways for you. Yeah, for sure I think it’ll be good. There aren’t really any expectations on me. I just need to go out there and race 20 laps each Saturday night and will see where we end up. You’ve probably been watching all of the 450 races so far this season and it’s been a hell of a series, with a number of battles taking place in every main event. You’ve got Stewart confident and back at full speed, you’ve got Villopoto and Roczen there every night, you have Dungey and Barcia starting to come around, and then there are the impressive upstarts such as Brayton and Peick and Tickle and Hill. Where do you see yourself falling into that whole brawl? Honestly, it’s going to be hard to say. I mean all I can do is try my best. I’d love to be mixed up with those guys and running up front—that would be my goal—but we’ll just see how it goes. We’ll take the days step-by-step and get through practice and qualifying and then get through my heat races and then we’ll just focus on the main event. I’ve never actually done a 450 SX main event so I think it’ll be good to finally do one now. I’m really looking forward to it. And I like the east coast tracks, as well. Barcia and Roczen are about the same age as you, aren’t they? Yeah, me and Barcia are the same age and Roczen is just a couple of years younger. Those two had a good mash-up last weekend so we’ll see how all that plays out! Do you see yourself being right in there and mixing it upright away with those two? You guys are all part of that next wave of young guys starting to really make a collective mark. Yeah, for sure. I think the next wave is going to be really good, you know? You look at Roczen and Barcia and Tomac and me—and I’m probably missing some people—and it’s going to be a good group of new young guys in the 450 class, so it’s going to definitely be exciting. And how about Chad? He’s still in the hospital, isn’t he? Yeah, Chad had surgery last night and he’s out of it a little bit today but I’m going to have a talk with him soon and tell him how things are going. I’ll be stoked to have him at the races and having help me out. That would be awesome. Did the Monster Energy Kawasaki factory team entertain the idea of riding and racing the injured Jake Weimer’s bike? Last question. Down deep, what are you really hoping to pull off in these 450 races? Top five? Top three? What do you see? I would just like to see me race at my full potential and leave the races healthy. If that happens, I’ll be happy. So what’s your full potential? Give us a number. [Laughs] Every time I put a number on something, it never works out! So, EJ, I’m not saying anything. I just want to ride at my best potential and wherever that ends up is where it’s going to end up. I think next month and half or so is going to be a fun, enjoyable opportunity and I’m just thankful for the opportunity to race with these guys.